Special Pricing & Shipping Rates to California. Pick-up your order at our Northern California or Southern California U-Line warehouse to avoid shipping costs. U-Line maintains its position at the forefront of the industry. Bringing the convenience of a personal wine cellar to any location in the home, a U-Line Wine Captain is the perfect companion for entertaining – or just relaxing. A convenient push button digital control integrated in the lower bottle retainer sets and monitors the storage environment. 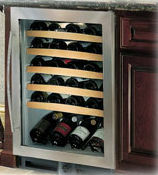 U-Line’s unique triple temperature zone design adds versatility in storage, housing three different types of wine at their optimum serving temperatures or safely storing a single type of wine throughout the entire cabinet. Designed to impress and inspire anyone with an interest in wine, a U-Line Wine Captain can provide cellar conditions for a small collection or offer additional storage for those with extensive collections. As the first North American appliance manufacturer to develop a residential wine storage unit, U-Line understands that proper storage is critical for wine and has engineered all Wine Captain models to provide a safe and stable environment. U-Line Refrigerated Drawers Offer 30% more capacity than other drawer models available, in only 24 inches of space. What makes this unit truly leading edge is the three-piece organizing system that maximizes internal storage while keeping items in place and within easy reach. Greatest internal capacity of any drawer model in the industry. Unique, three-piece organizing system increases storage capacity. Sleek, stainless steel interior. Digital controller makes setting and seeing the temperature effortless. Full extension heavy duty drawer slides allow easy accessibility to back of drawers. Black models are equipped with 3/4" full overlay capabilities for ease of installation. Product designed exclusively for built-in installation - anchoring required. U-Line sets the standards, offering choice and value with the most diverse built-in, undercounter refrigeration line in the industry. More models, sizes and features enable you to select the product that best meets your needs. Enjoy the styling, performance and innovative technology that has made U-Line the industry leader for more than three generations. These units can be built-in or freestanding. 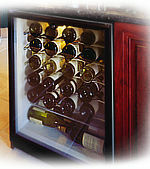 U-Line's unique, triple temperature zones ensure the proper storage temperature for the right wine: red wines are stored in the upper section of the cabinet (approximately 60¡F or 15¡C); white wines are stored in the middle section (approximately 50-55¡F or 10-12¡C); and sparkling wines are stored in the bottom cabinet section (about 45¡F or 7¡C). The exciting new Echelon line proves, once again, that for every time and for every place there is a U-Line. The Echelon Series establishes a dynamic new standard in undercounter ice making and refrigeration. Offering unparalleled choice, Echelon combines new technologies and inspired designs with all the superior benefits that are U-Line signatures. Echelon emerges at a level of style and performance that will make these models an attractive focal point or an integrated enhancement that blends seamlessly into any living environment. Contoured facades and soft curved lines make a statement never before seen in the industry. Designed for improved performance, these unique models reduce noise, provide greater refrigeration capabilities, and further improve upon existing low energy usage. Custom Doors All Echelon Series models with solid doors can be integrated into the surrounding dŽcor with an optional full overlay custom door panel or blended with cabinetry using a standard 1/4" custom panel. Glass Shelves Fully encapsulated to contain spills and contoured for a high style look. Indoor Storage Removable shelves are fully adjustable and the contoured design offers storage for the widest variety of container sizes. Slide-Out Wine Racks Full extension, maple-trimmed wine racks on Wine Captain¨ Models are complemented by an exclusive fixed, 40 degree angled, display shelf to show-case special vintages. Recessed Shelf Supports Encapsulated shelves rest firmly inside a clean, sleek interior. Self-Closing Door A specially designed hinge system activates eight to ten inches from the closed position, ensuring secure door closure. Stainless Steel A stainless steel cabinet, full-wrap door with finished corners, and a new sculpted stainless steel handle provide clean, seamless styling. High Energy Efficiency Units offer both noise reduction and outstanding freezer and ice storage capacity. Outdoor use Models U-Line's warranty applies the same for outdoor and indoor installations, (Specified Models) Outdoor use does not void the warranty.